The Professional Series MFC-J6910dw will help your business thrive with the versatility of duplex printing, copying and scanning. Create two sided documents up to 11inch x 17inch in-house. Easy to setup wireless (802.11b/g/n) or wired Ethernet network with embedded web support connects to others on a network. The 3.3inch TouchScreen color LCD display features interactive and easy to use menu navigation. Dual paper trays (up to 250 sheets each) offer a total capacity of 500 sheets. 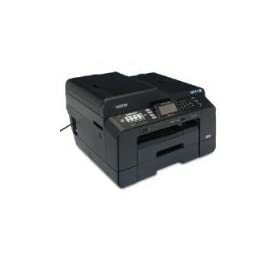 Uses Super High Yield (XXL series) replacement ink cartridges approx. 2,400 pages black and 1,200 pages color. Convenient unattended fax, copy or scan with the up to 35-page ADF. 3-year limited warranty provides peace of mind.